Health Aid L-Theanine is an amino-acid naturally found in green tea which can help reduce oxidative stress and promote all around general health. 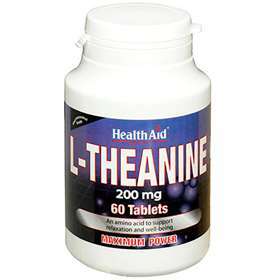 L-Theanine can increase alertness and concentration during the day without drowsiness or the negative effects of caffeine. At night it can help to relax the mind for a more restful sleep. Promotes a relaxed, alert mind. Free From Yeast, Gluten, Starch, Corn, Wheat, Soya, Dairy, Gelatin, Lactose, Tree Nut, PeanutsAdded Sugar and Salt, Artificial Colours, Preservatives & Flavourings. Suitable for adults and children over 16 years of age. Take one tablet daily. Do not exceed recommended daily dose, unless or as advised by a suitably qualified professional. Bulking Agent (dibasic calcium phosphate, micro crystalline cellulose), L-Theanine, Anti-caking Agent (stearic acid, veg. magnesium stearate), Glazing Agent (PVP).